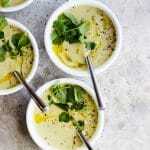 Vegan cream of celery soup, made without dairy and ready in under 20 minutes. It's wonderful served hot on a winter night and chilled in the summer. What is your most used kitchen appliance? It used to be my juicer. But for sure nowadays it is my blender. I just got my hands on the A2500 from the Vitamix Ascent Series (thanks, Vitamix!). And I love it a lot. And it is quickly replacing my other blender beloveds. Soup is a staple in my home. And if you’re a regular reader of With Food + Love, you already know this about me. As a child, I only preferred soups with a lot of texture. 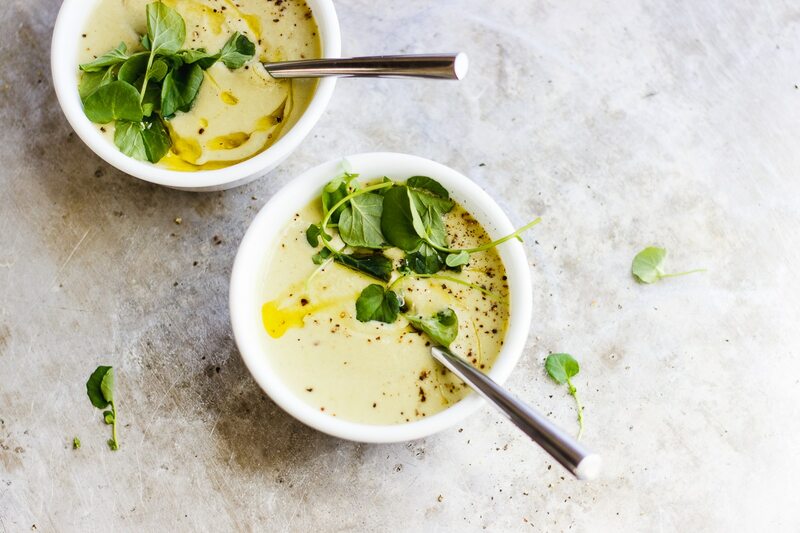 Smooth and creamy soups felt like a waste of time. But now, as an adult creamy soups, especially when topped well, are the ones I crave the most. 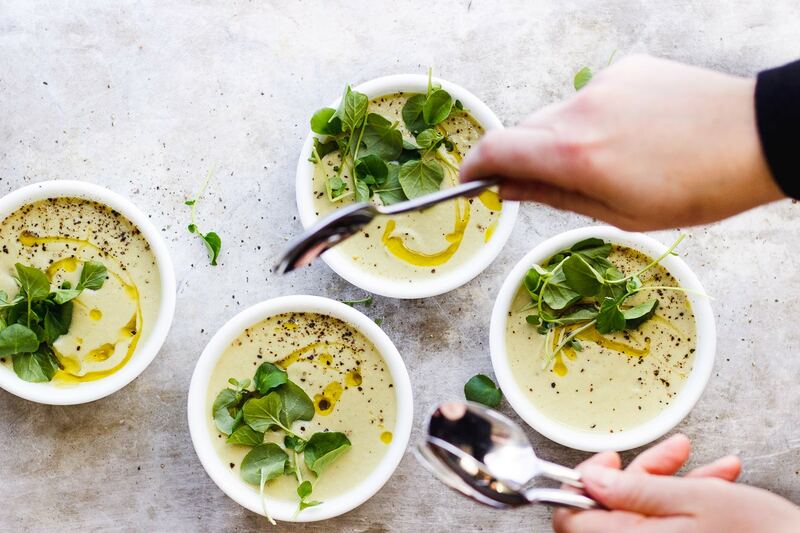 This vegan cream of celery soup is a simple, humble bowl of unassuming flavor and impact. And my favorite thing to eat right now. 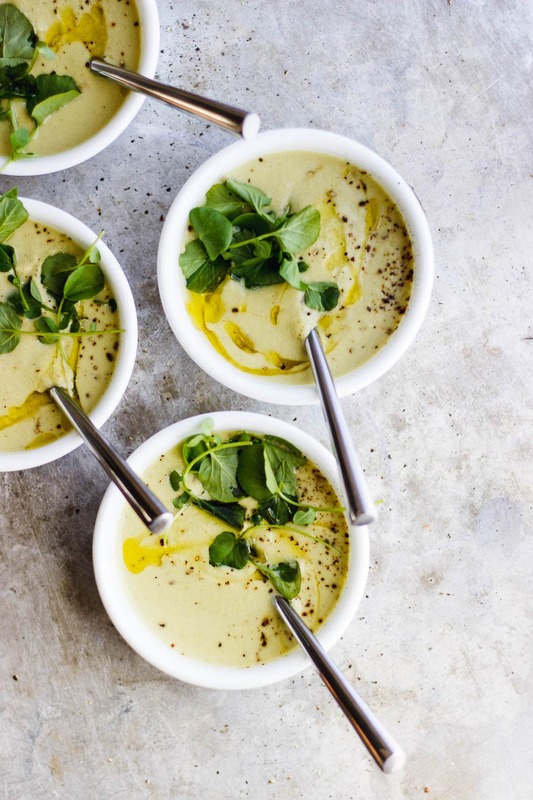 This soup combines a little bit of zip from the lemon and a whole lot of comfort from the cashew cream. Raw cashews are used here as the base, and I’m really happy about a new process I developed to skip the soaking step. Essentially, you make this vegan cream of celery soup by first sautéing the onion, garlic and celery. Then, you add in parsley, raw cashews and water. Let the mixture simmer for five minutes and then blend everything together. The resulting soup is ultra creamy. If you don’t like cashews or are allergic, I’ve made a note of substitutions you can make in the recipe. A few more quick things! I am hosting a brunch pop-up this weekend with my friend Alex Caspero, local yoga instructor and registered dietician. There will be a restorative yoga class, led by Alex. A three-course meal, prepared by me. If you’re local, click here to get more information and buy your tickets. I know we just wrapped up Valentine’s Day yesterday, but I’m hooked on this rose-infused chocolate bark I made for FEAST Magazine this month. And, I’m over on Olio City sharing some of my favorite spots in St. Louis. Have a read. If you’d like. Heat the oil over low in a large saucepan, and sweat the onions for 2 minutes. Then add in the lemon juice and stir. Next turn the heat up to low-medium and add in the celery, salt, pepper and garlic. Continue to cook and stir occasionally for 8 minutes more. Then turn the heat up to high and add in the parsley, cashews and water. Cover and simmer for 5 minutes. 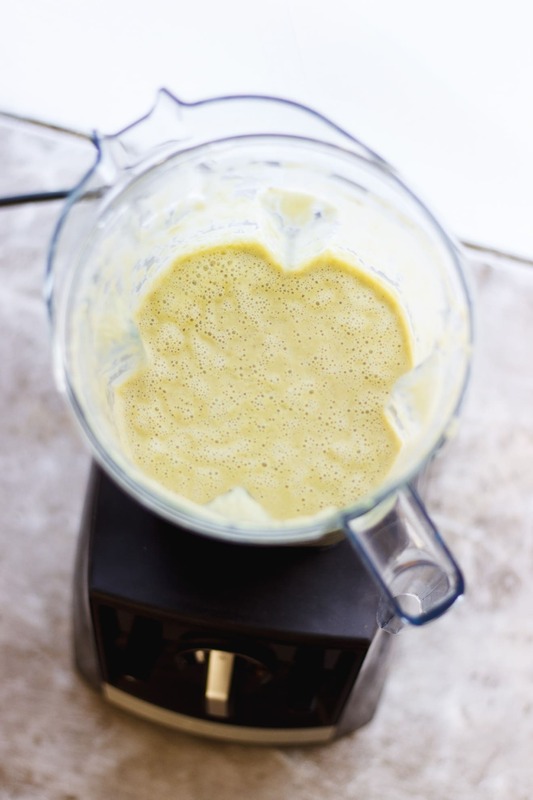 Then pour the soup into a blender and process until completely smooth. Serve with a swirl of olive oil, fresh watercress and black pepper. If you don't prefer watercress - sprouts, fresh parsley or celery leaves would work great instead. 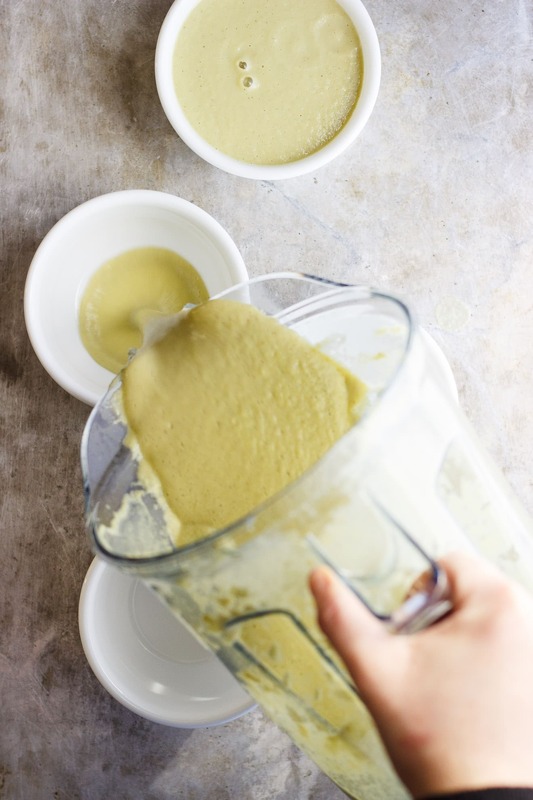 If you are allergic to or do not want to use cashews, skip them and add a 1/2 cup of heavy cream instead. This post is in partnership with Vitamix; all opinions are my own. I still prefer soups where I can see the actual vegetables in it. I’ve been making the creamy ones since last year and the more I experiment the more I like them. Yours is on my to-make-soon list already! I got a Vitamix for Christmas and it is the best blender to make soups with. I’ve been looking for new recipes, so I’m happy I stumbled on this post. Hi Catina – unfortunately almonds wouldn’t work. They don’t have the right creaminess and consistency. I would try raw sunflower or pumpkin seeds instead. I am so, so, so excited to make this soup, Sherrie! And I can’t wait to hear how your brunch pop-up went. Sending big hugs. This is absolutely delicious. It’s my new favorite thing. Well, soup anyway! Thank you. You are so welcome. I’m happy it’s a part of your life! Lovely recipe! I’ve made it twice now and everyone has loved it, even the non-celery lovers. Yay! I love that so much. I just made this. So good! I don’t have a great blender so it wasn’t as smooth as I would have liked. And being from Buffalo, celery clearly only goes with wings. So I topped it off with blue cheese and drizzled on wing sauce. It was the best! This sounds amazing! I can’t do cashews, any recommendations for an alternative? Walnuts? Almonds? Hi Christy – the cashews work here because they’re extra creamy and they have a really mellow taste. Walnuts and almonds would not give you the right texture and consistency but raw sunflower or pumpkin seeds could. They would have a stronger and more defined taste than cashews though. If you can do soy, you could lower the water to 2 cups and add in 1 cup cubed tofu instead. I hope this helps! I just made this for the first time. Oh so good! I finished it off with a little truffle salt sprinkled on top. Thanks! Hi Marci – I’m so glad this was a hit!